The option of in-home addiction treatment may appeal to a drug or alcohol addict who thinks it may protect their privacy, or prevent them from having to leave home or work. Some may see it as a way to avoid questions from colleagues, or friends or family as a result of a stint at a rehab. If the person is still a functional addict, and still managing to hold-down a job or maintain a business, he or she may see the in-home addiction treatment option as a way to continue without the necessity to be absent for addiction treatment. While these may be factors that a person takes into account in their decision as to what form of rehabilitation will best work for them, there are risks which need to be factored into the equation, as well. In-home addiction treatment takes place in the addict’s home, and is seeking to bridge the gap between needing to stay at home as opposed to being gone for a period of time necessary to do a residential rehab treatment program. A range of services are provided to the person at home, depending on the in-home addiction treatment team and how it approaches addiction treatment. It can include the service of medically supervised detoxification from alcohol, opiates, heroin, and a host of the other opioid prescription painkillers. While the idea of staying home to receive treatment for addiction, somehow resulting in restoring sobriety and “fixing” what originally led to the abuse of alcohol or drugs may have its appeal, it also has its risks. It may be that the risks involved in attempting to safely coming-off highly addictive drugs and alcohol in one’s own home may present greater risks than recognized by those considering in-home treatment for addiction. Likely the greatest risk faced by the addict or alcoholic attempting to come-off alcohol or drugs at home will be the “detox”. Detox has become somewhat of a catch-all term to describe getting the addict off the highly addictive drugs or alcohol by using other drugs, and while under medical supervision. Quitting alcohol and safely coming-off of it presents a risk to the alcoholic. A sudden cessation of alcohol consumption is capable of causing hallucinations, convulsions, seizures and death. Going “cold turkey” is not something an alcoholic with a long-term and serious history of alcoholic dependency should consider attempting, especially at home. 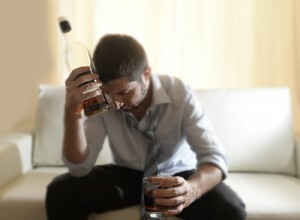 Cessation of alcohol consumption and the ensuing physical and mental consequences can include nausea, anxiety, insomnia, delirium tremens (DTs), hallucinations, convulsions, seizures, and heart failure. The individual’s health, age, and history of alcoholism would all be influencing factors which would be vital to take into account. While the idea of being at home may seem somehow safer or more comfortable, the risk factors involved with coming-off alcohol, especially in cases of long-term consumption, may be best managed and controlled in a medical detoxification-type setting. Heroin is another highly-addictive drug which may not be well-suited to an in-home treatment program. Because the nervous system of the heroin addict is accustomed to the chronic presence of an opioid narcotic, abrupt cessation of the drug is capable of causing dangerous and excruciating withdrawal symptoms. It symptoms include anxiety, abdominal pain, body pain, nausea, insomnia, diarrhea, chills, sweating, weakness and vomiting. Because the use of heroin leaves the heroin addict with increased risk of Hepatitis B and C through the use of shared needles, pulmonary complications, kidney and liver disease, and HIV/AIDS, an out-of-the-home setting with prompt access to any needed medical care may be a risk-reducing choice. Another all-too-common common addiction is that of methamphetamine. Coming off of meth produces a host of mental and physical symptoms which can be intolerable enough to prevent the meth addict from overcoming the addiction. The addict attempting to come off meth may experience anxiety, aggression, intense drug cravings, extreme fatigue, paranoia, severe depression and suicidal thoughts. Remaining in an in-home environment while attempting to overcome a meth addiction presents the risk of all-too-easy access to the drug, just as it does with heroin, alcohol, or any other drug to which the addict is addicted. Much of what drives the drug addict and the alcoholic to use stems from unhandled problems and situations in their own personal environment. When at home, the substance abuser is still surrounded by those people and situations which he or she has not yet learned how to deal with effectively without escaping into drugs or alcohol. The addict at home knows where the dealers are, where the other drug users are, and where to get more of the substance to which they are addicted. So it goes with the alcoholic, as well. That which drives the person to use or to drink is all around them in their daily environment at home, and that is the greatest risk of all to can in-home addiction treatment program.